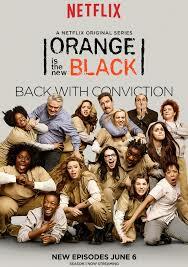 Orange is the New Black (season 2). New characters, charged situations, bad hair days. In Justified, Season 4, Marshall Raylon Givens tracks a cold case involving drugs and money. In season 5, side character Dewey Crowe returns with more criminal members of his clan while Boyd Crowder finds himself between the rock of the Detroit mob and the hard place of a Mexican cartel. Meanwhile, BBC fans can relish in Death comes to Pemberley, in which Elizabeth and Dracy (Pride and Prej.) solve a murder. Also recently added: Wolf Hall, a handsome production on rise and fall of Anne Boylan and. Foyles War 8, in which Christopher Foyle, now with MI-5, solves three chilling cold war mysteries.